Having a beautiful lawn requires attention. Over the next few weeks, our blog will cover a few of the most important dynamics of creating lush, green turf. I’ll begin with lawn prepping and mowing. In the next few weeks, I’ll cover fertilization, weed control and pest/disease control. Creating a healthy lawn is a process that starts with choosing the right grass seed for your location. The first thing to understand is: grass doesn’t grow in the shade. While some grass is more tolerant of shade than others, it will still need several hours of dappled sunlight in order to look good. Often it’s possible to thin out trees to permit enough light to reach the lawn. If the area is permanently in shade, you might want to forget about planting grass there, in favor of ground cover, hardscape or mulch. Several varieties of grass are commonly planted in our area; each has its own strengths and drawbacks. There is no “right” grass for all lawns. 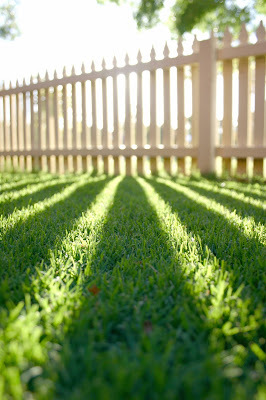 The right grass for you depends on your soil, sunlight and priorities: do you want a lawn that stays green into fall? Or grass that can take a beating from active play? Or a lawn that can survive with less water? Kentucky Bluegrass is popular and durable but doesn't like shade. Fescue and perennial ryegrass are also common in our area, and are more shade tolerant. Most lawns are planted with a mix of these grasses, and different grasses will dominate different areas of your lawn. Follow this link to Cornell Cooperative Extension for more information on grass types. It’s often useful to begin your lawn program by checking for soil compaction. Try inserting a long screwdriver into the turf. If it doesn’t easily go in 6” deep, the soil is too compacted to encourage your grass to grow. You’ll want to use a core aerator to pull plugs from the soil and stimulate the roots to grow. This will also help to avoid thatch buildup. If you don’t use a professional for this task, rent or borrow an aerator: the spike shoes and hand tools you see advertised really don’t do the job.This is typically a fall activity, because the plugs may contain weed seed that you don't want to encourage to grow. Top dressing with a thin layer of compost in the spring will also get your lawn off to a good start. (This can also be done in fall.) Overseeding can help fill in bare patches. One of the most important parts of lawn care is mowing. Proper mowing actually encourages your lawn to grow thicker and stronger, by channeling the growth energy into the roots. We recommend setting your lawnmower at 3” – 4”. Maintaining a lawn at less than that makes the lawn very vulnerable to drying out and scorching. Many people are using mulching mowers now, too, which distribute the grass cuttings back into the lawn, where they decompose, releasing their nutrients back to the soil. Most experts recommend mowing about 1/3 of the length of the blade every time you mow. For mulching mowers, this will keep the cuttings short enough to sink back into the lawn.